Above – Leaders and scouts all pitch in to do some repairs at Smith Creek near Utica. Below – Boy Scouts and their Leaders enjoyed some time learning from survivalist Creek Stewart as he visited them at Coyote Hollow as part of The Big Idea this year. Above – Local Scout leaders inspect the repair work done on the bathroom facility at Smith Creek near Utica during The Big Idea event. Above – Boy Scouts spent hours working at Smith Creek Recreation Area near Utica on Saturday, April 16th. Payton Davis (right) from David City and Ian Stahr from Utica were two of the scouts staining the new boards on the picnic shelter. How many hours of labor can a group of local scouts provide to a NRD facility? How about 581? That is how many hours of service the scouts and their leaders in the Prairie Winds District donated to the NRD at Smith Creek on Saturday, April 16th. 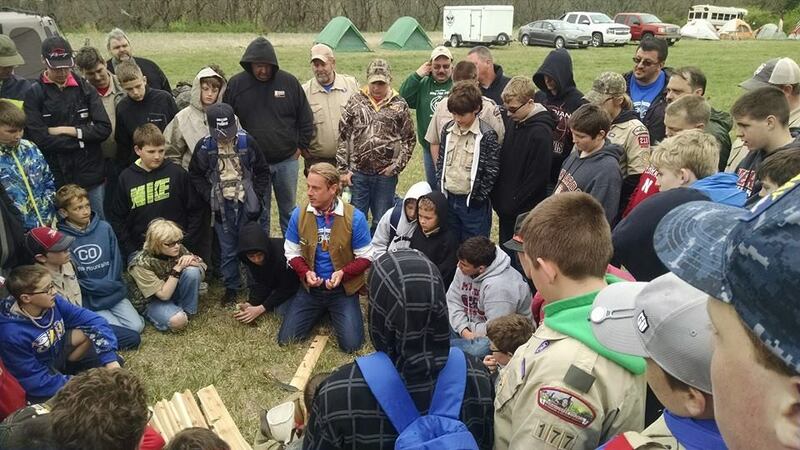 Over 125 scouts and leaders camped out at Coyote Hollow near Seward on Friday night before hearing Creek Stewart, a survivalist and Eagle Scout, who hosts the TV show “Fat Guys in the Woods” speak to them about the importance of leadership and service. During his talk Stewart also showed the scouts how to start a fire with a guitar pick. After Stewart was whisked away to spend the rest of his day with more scouts and leaders in the Cornhusker Council, the group grabbed a quick lunch before heading to Smith Creek NRD area near Utica. The scouts and leaders fixed fencing, cleared undergrowth from trees and paths, repaired the restroom and painted the bridge. They also made repairs and painted the picnic shelter. The trail around the water was cleared of trash and overgrowth. The Cornhusker Council recruited several event partners who contributed $126,217 in funds to support after school scouting programs. This is the third year that the Cornhusker Council has undertaken “The Big Idea” but the first year that an event was held in each of the three districts that comprise the Cornhusker Council. This year, scouts and leaders were able to participate in serving the communities where they live and play. In the past the scouts planted over 300 hundred trees at Pioneers Park in Lincoln and last year the scouts spruced up Mahoney Park in Lincoln, planting trees and replanting flower beds. Scout troops from York, Seward, Utica, Exeter, Crete and Milford participated.